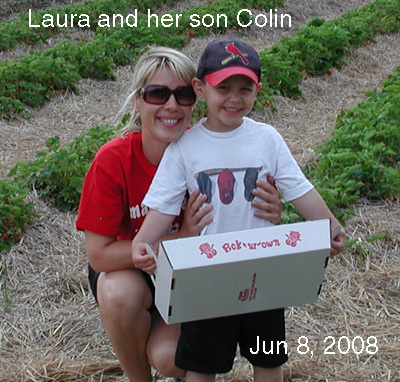 Laura Kilroy was a student at Washington University and worked summers at Lakeview Farms in the early 1990's. Laura was one of those people that seemed to have it all together: Personable, Considerate, Attractive, Excellent Student, gifted Soccer Player and a natural at dealing with people or getting difficult work done. During construction of Aspen Point Subdivision, I could always tell when Laura was supervising pickers near where the homes were being built -- there was an unending stream of whistles from the construction workers on the roofs as Laura got near! Besides the construction workers, the whole Lakeview Farms staff and even her mother, Mickey, was more than slightly in awe of her! It came as a surprise to all of us to learn that Laura did have one inexplicable problem --- the current guy in her love life was treating her badly. I never forgot our resident farm philosopher at the time, Greg Phillips, giving a bit of useful advice during break to several of the young teenage boys working at that time: "Boys, if you ever find a girl like Laura -- hold on to her -- she is a keeper!" Greg did find his own "Laura" -- her name Is Ileana. Laura currently lives in the St. Louis area and is a pharmaceutical sales representative. Her husband is a baseball manager in the Cardinals minor league system (class AA).